Are you itching to get things organized before back to school time is in full swing? 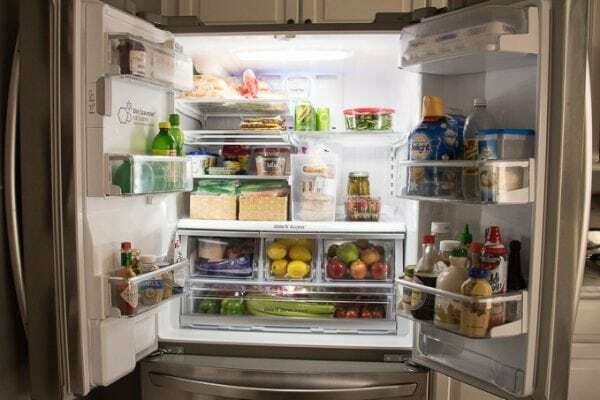 Knowing how to organize your refrigerator may not come to the top of your list, but it should! The kitchen and your refrigerator is the where much time is spent in any family. Check out these refrigerator organization ideas to be ready for the new school year and help your family function like a well-oiled machine. Shelf Mats – Protect shelves & make them pretty! You can pick up plastic table mats almost anywhere. These versatile mats are able to be cut to the desired size, making them an inexpensive and perfect fit for your refrigerator shelves. They can easily be removed and cleaned at any time, and with so many pretty patterns, they’ll make your refrigerator interior look amazing! 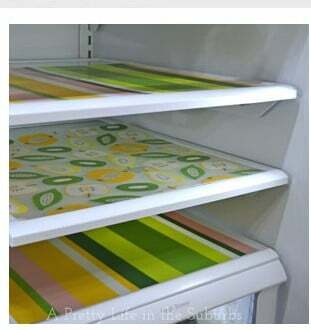 Try using shelf mats in your refrigerator and you’ll wonder why you didn’t think of this sooner. 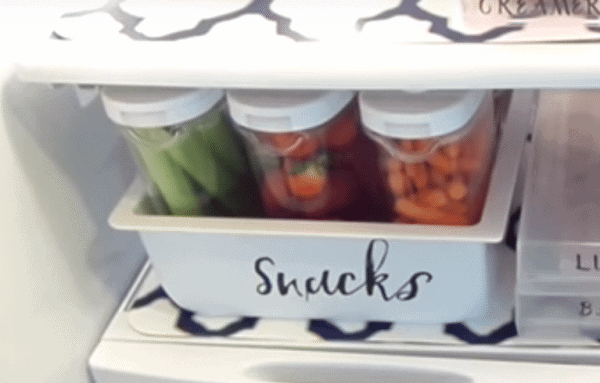 Snack Bins – Keep them visible! We all love our snacks, and what better way to offer healthy snacks and keep them tidy than in designated snack bins? You can use old refrigerator drawers, bins, or baskets to dedicate to snacks. Simply choose the snacks your family loves to eat, and group them together in the snack bin. You can even include individual containers for things like carrots, celery, or berries. When snacks are pre-washed and ready to eat, your sure to have them gobbled up- especially when they’re so easy to find. Bacon Keeper – Store cold cuts too! One of the handiest refrigerator organization ideas is to invest in a bacon keeper. You can purchase these at your local Walmart or on Amazon. 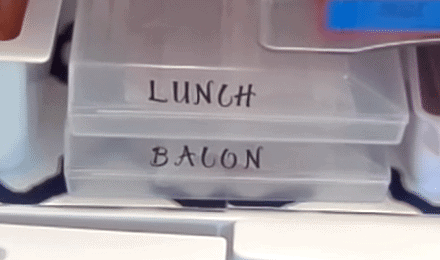 A bacon keeper keeps your uncooked bacon fresher longer, and is a great refrigerator organization hack for lunch meats! Use a bacon keeper to store your bacon, cold cuts, and other cooked meats so they’re ready to cook and/or eat. Label Bins – Use scrapbook letter stickers/print on Peel & Stick paper! There’s nothing nicer than attractively labeled bins to easily show where things go. Why not do this in your refrigerator? You can pick up scrapbook letters at your local craft store or office supply store, or use Peel & Stick paper at home on your printer to create beautiful and personalized labels for your refrigerator bins, shelves, and drawers. This is a great tip for how to organize your refrigerator for your family. Refrigerator items will stay tidy, and you’ll enjoy looking at your pretty labels knowing everything is in its proper place. Vacuum Seal Raw Meats – Keep at bottom of refrigerator to prevent cross-contamination! If you can, consider investing in a Food Saver. Vacuum-sealing food is a proven method to preserving the freshness of many foods, especially meats. When meats are exposed to air, they oxidize, altering the appearance and freshness of the food. By using the vacuum-seal method, you’re able to extend the life of your meat, prevent oxidation, and keep meat juices contained. With or without a vacuum seal, meats should always be stored on the bottom shelf of the refrigerator in a self-contained pan/tray to prevent any raw meat juices from dripping and contaminating other refrigerator foods. As part of your organizing project, you should also make sure your refrigerator appliance is operating efficiently to maximize your efforts. Call your local technician for service and any repairs you may need to ensure your family’s food supply is safe and up to the challenge of the new school year. What Happens When a Refrigerator Stop Cooling on Refrigerator Side?